Sometimes in the retelling of an event, something is lost in the translation. In fact, I wonder if we do justice to the original at all in the retelling. But I think that what I saw is worth the risk. Recently, I went to a wedding at the Chapel in the Men’s Mission; a seemingly unlikely place for such an event. The bride was a 25 year plus staff member of the Mission. Now although the wedding was open to anyone in the building, there were about 40 odd people in the Chapel; a smattering of relatives, friends, colleagues and residents of the shelter. I confess that I have not been to a lot of weddings in my time, but this was one I will remember for a long time. It was so comfortable and easy; a place of warmth, love and acceptance. At the Mission, the availability of food and drink does not necessarily need an announcement. The wedding ceremony concluded and then they opened the doors to the Chapel. Like I said, there was no need for an announcement as the residents began to casually and in some instances, intentionally walk in for the food and drink. It was the middle of the evening, and like most of us, the residents get ‘the hungries’. Some residents walked in and seemed to be aware of what they were walking into, others seemed to have little insight with only one thought in mind, “Can I have some of that?” In most cases, permission was not sought. But here is what got me generally, and specifically with one moment of pure grace. The bride and groom moved about the room undeterred with the mixed motives. I suspect that the doors were thrown open; fully expecting that some would come for the celebration and others would come to satisfy the ‘hungries’. No matter, all were welcome. As the residents came in there was one moment that even the best photographer would not have been able to capture its essence and I fail now even as I attempt to describe it. A resident walked in and began to make a rather straight line to the food and drink. 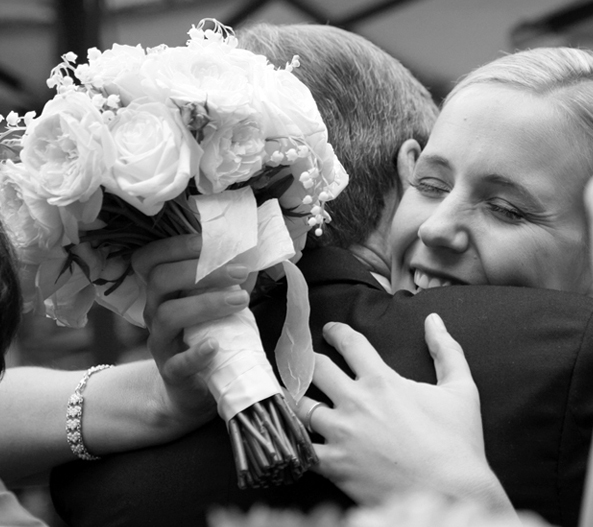 The bride walked directly to him and just before he got to his apparent goal, she gave him a warm embrace. Something he could do nothing but return. I don’t know whether she had specifically invited him or whether he would have sought her out to join her celebration, but there it was; pure grace. One more thought and maybe this is a bit of a stretch, but I wonder if her joy, which was so evident throughout the evening, made room for that expression of grace. If it did, oh that we would experience more joy in our lives. Imagine who would receive this grace as a result. We extend our warmest congratulations to Linda Sierolawski & Doug Adams. May they enjoy a lifetime of happiness.